First time making french toast – success! I LOVE french toast and usually order a side of it when I eat out for breakfast but have never actually made it. Well this special Saturday morning brunch changed that. I used a recipe from The Joy of Cooking and used hemp milk instead of regular milk. I also added Captain Morgan Spiced Rum instead of vanilla and a dash of cinnamon. They came out great! I am so proud of myself! One thing I learned in the process is that it is really important to have a really well buttered skillet for that nice crispy french toasty crust and delectable custardy center. Served with a sprinkling of cinnamon sugar and a gentle snowing of powdered sugar. 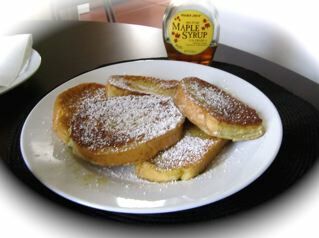 For french toast this good, use REAL maple syrup. It’s a little more expensive but sooooo worth it.